My son-in-law will spend this weekend on his bike. Tonight is the annual Dunwich Dynamo ride, which he took part in for the first time last year. Then he went to the London start by train, cycled to the finish overnight and then biked here in time for lunch, putting his bike in the car and going home with Weeza and Zerlina (Gus wasn't born yet). This time, he plans to cycle the lot. That's right, he'll cycle from just north of Norwich to London, cycle overnight to Suffolk and then ride home again - that's going to be about 350 miles all told. And then he'll cycle 22 miles to work on Monday. Well, that's the plan, anyway. Barking mad? Well, yes, he fits in this family rather well in that respect, although that's not the way that any of the rest of us would display our oddity. I should pause here, by the way, to mention that I can't see any way in which I'm odd, except that it's taken others to point out that the Sage is, very, and I hadn't noticed until then, but actually it's quite true. So at the least I'm incredibly unobservant - but I did know that already. It's all in the eye of the beholder anyway - I wanted to check something I'd written in an email to someone quite some time ago and looked it up this morning - evidently at some time we had had a conversation about blogging, which she found a strange hobby. Not that it is, but I said politely "Blogging is indeed quite peculiar, but then so are cocktail parties and going to church if one examines them closely enough." I knew that I was one of the three people named in the school's Critical Incident plan, but I've just discovered that both of the others are going to be away at various times in August and so I am potentially at the sharp end for the first time. It's highly unlikely that anything will happen, particularly in the school holidays - the last time it was acted upon was a few years ago when some pupils had a car accident on the way to school. All the same, I'm getting my very own copy, ooh, will study it assiduously and trust I never have to do anything else about it. Talking about the school, it was the Year 11 leavers' Prom last night. This is something that is taken with great enthusiasm. There is a decorative theme - this year it was The Lion, The Witch and The Wardrobe - and everyone dresses up most beautifully. The Head suggested I might like to come at the start, to see people arrive, and so I did. There are always some who vie with each other for the most unusual form of transport - a tractor probably got it this year - and lots of people; parents and early arrivals, cluster outside to greet and applaud them as they turn up. All the boys were in suits, many of them in dinner jackets* complete with black bow tie, and the girls' dresses were beautiful - as were they, there wasn't anyone who didn't look lovely. Some of them looked a bit self-conscious, especially the ones in strapless ball gowns, but they all looked happily excited too. The Deputy Head, who is blonde, very slender and attractive, wore a slinky long red dress with a black bolero jacket and the Head was in a dinner jacket and looked pretty damn good, I must say. Well, I did say, I told him he scrubbed up surprisingly well and I think he was pleased. *I think you call it a tuxedo in America, darlings, and it is taken to include trousers. Or the kilt of course, if you are of that persuasion. I can't imagine what I was worrying about, darlings. Of course it all got done and quite a lot more besides. We were having guests to stay on Wednesday and Thursday nights and I'd forgotten that I'd promised to babysit for Weeza while she went to the dentist on Wednesday afternoon (the appointment being at 2.30, this gave rise to several witty remarks between Rog, Tim and me on Twitter. Oh, how we laughed) but that was good because we hadn't seen each other for ten days or so, since the Sage's birthday, and it was the only opportunity this week. I hadn't done any housework since then either (apart from obvious basic hygiene necessities) and even then it had been downstairs. So when I arrived home, I put a chicken to roast - I'd been planning a casserole but then decided to do a cold meal because I thought they might be tired after their flight and drive from Stansted and want something simple - and then ... well, darlings, I had no idea that it was possible to clean this house in two hours. It normally takes about three days, and who has three days to spare on housework? Simpler not to start, then you don't fail. Admittedly, I didn't move furniture when I hoovered, I didn't wash windows or do thorough stuff like that, and I won't say the house was thoroughly gone through. However, I did clean *in* every single room and if you include hall, landing, cloakroom, passageway and so on, each as separate areas, that makes fifteen of them and I haven't ever done all that in such a short time, which just shows what tidying up does for you. The Sage and I each have one messy place because - well, we like being untidy. So I decided not to blog. I got up early yesterday to catch up on computer work, spent a few minutes at a time replying to the most pressing emails as they arrived (life can be simplified with technology, I just did them quickly on phone or pad and they didn't eat into my time) and wound down at the end of the day with Facebook Scrabble. It doesn't feel right not to blog most days, but habits are there to be broken after all. Anyway, the guests - I'd been put in touch with a family in Berlin whose daughter wants to study in England for half a year - this is encouraged in German schools, once the students have taken their GCSE equivalent exams. So she and her father came to meet us, see the school and meet the pupils and teachers. It was the Year 12 induction day yesterday, so she was able to join in with that. She is a delightful girl, we're still looking for a host family for the period she's here: of course she can stay with us, but old dears like the Sage and me won't be much fun for a teenager and it will be far better for her to go to a family with children her own age - and I hope that this will be sorted out soon. But it's been fun. I've learned more about myself of late. Mainly, and I've touched on this before, that the more sociable I am, the happier I am. I still need time by myself, but my natural inclination to solitude makes me too introspective. So it continues to be the social life for me. Plus rising to challenges, and school gives me that. I can't do the same thing day after day, I love not knowing what's going to happen week by week. I'm still lazy though. Now, I'm going to open my post (I've been out all morning) which comprises a dividend cheque, the electricity bill and a hand-written envelope in writing I don't recognise, and then I'll sit and read the papers. I might even turn on the tennis. I haven't done that yet this week. I might have cracked the problem. I've been through all the settings of any apps which use push notifications and found that the BBC website was set to update every five minutes. I certainly never set that, it must have been the default. I might go days without looking at the BBC website and wouldn't need to have it update automatically. That I didn't have the problem between December and March is slightly more of a puzzle, possibly I didn't have on push or else there was an update to the app and it changed or reset the control. I have now changed it to update only when I open the app, but I've switched push off in any case. I shall turn it back on a few days before my month is up on the 10th of next month and see if automatic email and other updates make much difference. I've used just over 2 MBs a day for the last three days since I turned off push. We've had a succession of callers today, which has meant that I haven't got anything done and I'm feeling quite overburdened at the moment. I meant to take last evening off (I know darlings, a Sunday evening spent not working, outrageous) but work came in that needed a prompt reply so I spent a couple of hours at the computer after all. This evening, I'm going to throw caution to the winds and print off the papers I usually read online, so that I can do my work sitting in a comfortable armchair rather than here on the backless stool that is so marvellously good for my posture. Slump, darlings? Never. The Open Gardens went really well. It rained hard in the night and at 4 am I went into the bathroom where there's a wifi signal and checked the forecast. It was due to clear up by 1 o'clock. Dry in the morning, there was a sudden deluge at noon with a squally wind, but it became quite hot during the afternoon. All the householders were very welcoming and the gardens were lovely. Most of them are quite small so didn't take too long to see each and then we went to the church for tea and cakes. It might well be done again, I think a whole day would be better if possible and maybe some of us could offer to man people's gardens for a couple of hours so that they can get round the village and see the others. There's a busy week coming up and I'm way behind with my blog reading. I may take a day or two off from writing and come and visit you all and leave comments instead. I've been very remiss. By the way, I wonder if any of you can advise - my last phone contract had unlimited data, but when I went to renew in December the basic limit was going to be 500 MB. They checked my average monthly use and it was about half that so I didn't pay for any more. And for the first three months, this was fine. However in March, only a week past my renewal date I had a text to say I'd used 80% of my allowance and I had no idea why. Since I was in India for a fortnight in early April, I got by, but it happened again the next month. I consulted Ro and we decided that it was because I'd been downloading music onto Spotify so that I could listen to it offline - our broadband is so terribly slow that it hadn't finished downloading and every time I put on the app it was downloading and using up my data allowance. So I made sure that I only downloaded using wifi and am not downloading any more music and I expected to be okay this month. I'm not. A week after getting home, I'd used 350 out of 500 MB. I've hardly used it except for downloading emails and occasionally reading a newspaper or checking the weather. I have now turned emails to manual checking rather than push and I've only used 2 MB in the last day, but does anyone know why I'm suddenly using so much data, presumably on emails? Not having used more than an average of 250 MB a month for over 2 years and now it seems that I'd be using over 1000 without really trying, I'm quite puzzled. My usage hasn't changed recently so it seems that something else has. Any other smartphone users found the same thing? I used to listen to the radio, use the map, use the internet etc and now have almost entirely stopped doing any of these because I don't want to use up all the data I have. I should say that one can use the internet afterwards without incurring extra charges but it is very slow. So Squiffany's picture is in the paper. That's the Becc1es and Yagnub Journal and she's in the Sports pages, which is the reason none of us spotted it yesterday. I mean, how likely is it that any of us might read the Sports pages at all, let alone in the local rag? Anyway, she was in a gymnastics competition (she's only been doing gymnastics for a few weeks) and it has a picture of her with three other little girls - pretty as they are, they aren't a patch on my lovely Squiffany - and we're very proud. In other news ... it's been a quiet day in Lake Wo... no, it's been a quiet day at the Zedery. The Sage and I have only seen each other in passing all week, although we spent yesterday evening together as it happened, but only because six people came for supper. It's a church thing I'm afraid, other 'home groups' discuss things or read the Bible, we eat and drink. I cooked the pork dish that some of you might remember from the blog party - a sort of sub-goulash - and other guests brought wine and puddings. If I hadn't bought broad beans and peas from Tim and decided to cook pommes boulangère, all would have been easy, but as it was the Sage and I were frantically podding up to ten minutes before the guests arrived. Anyway, today I was all ready and waiting to catch up on topical matters with my husband, but sadly he was out most of the day. He didn't really have a lot to do, but he's the sociable member of the family. And at dinner time (fish pie) I went into the dining room to lay the table and found an open case with knives and forks in it. I enquired. He owned to having bought them today. I looked - and I approved, darlings, I had no choice. They are lovely, little dessert knives and forks dated 1807, we don't need them in the least and if I'd seen them I'd have looked, admired and passed on, but the Sage is a buyer and that's all there is to it. I have to be glad that he told me straight away - if he'd thought I wouldn't like them, he'd probably have squirrelled them away for a few weeks. It's true. I don't really excel at anything much, but neither do I fail miserably. I get by, I know my limitations but don't feel bound by them so I often leap blithely in and then flounder worriedly to the other side, but I get there. Today, I pushed myself. I used my imagination. I don't have a lot of imagination, although when someone else has an original idea, I can join in with enthusiasm and run with it. We've got an Open Gardens event on Sunday, you see. Our garden isn't open, I was bound sufficiently by my limitations not to get myself landed there, but I did agree to decorate a windowsill at the church. I'm a reasonably competent flower arranger in that I know a few rules but I don't have much flair nor enough knowledge to know when or how to break the rules. What I hadn't gathered was that there was a garden theme. Well, I knew that garden rather than florist flowers were to be used, but I was still thinking of a conventional arrangement until I discovered one arrangement in a wooden wheelbarrow and Dilly's in several watering cans - and very effective both of them are. I know. I've got a nice flat trug that I bought in Cornwall three or four years ago. That would be fine - I'd do a horizontal arrangement ... such as I've never done before. Bugger. So I looked out some clay pots that have a nice growth of moss on them, emptied the newspapers from the trug into the recycling bin and went to have a go. Darlings, it took me two whole hours. My friend Gill had the good idea of sticking stalks into the oasis as if they were the ends of the flowers clustered at the other end, but I did the whole thing - and awkward it was, having to straddle two pews and clamber over the backs of them to get to each end of the window. The picture doesn't show it well because, of course, it was taken into the light (I've had to lighten it considerably in iPhoto as it is). I'd have to take a photo at night to make it look good. But actually, I was pleased with the result. I'll probably have to replace the roses on the left by Sunday, so I didn't take too much care with their placement and they're a bit low. But overall, I got the effect I had in my mind's eye, and that was more than I'd hoped for. Pam and Peter's house is in a village on the western side of the island. They decided on a house in a residential area rather than a seaside villa so that their neighbours would be Greek people rather than visitors or ex-pats as they wanted to become part of the community for the months that they live there - in fact, they come and go to England frequently but are there regularly during the summer. The living room, two bedrooms and the kitchen are upstairs and there are two more bedrooms and a dining room downstairs, but we ate at the table in the kitchen rather than trot up and down the stairs with our food. Views from the balcony. The jasmine is cut back when they leave in October but had already grown up and over the railings. Snapshots of their village. Pam and Peter had pet dogs for many years until they started travelling so much, but in the past few years Pam has twice been bitten by dogs (never out of England, no fear of rabies) and is now wary of strange ones, so I appointed myself as protector when one was in the way. This one was charming, moved politely aside when we wanted to pass and then lay down again when Pam and Peter had gone past. A few days previously, we had taken their friend Julie out to dinner. She lives half the year on Corfu and has a delightful house in a village in the north west of the island. Her neighbours have a yappy little dog, not much more than a puppy, which Julie is quite wary of - one of those little terriers that looks as if it might bite, though I don't think it ever has. When we left her house for the restaurant, it was in the lane. Protector Z looked at it. I put on my Look. It scooted straight into its house and turned and peeped at me. We walked past, but it occurred to me that it might scuttle out again and attack from behind. So I turned and it was just coming out. I Looked. It vanished. Hah. Actually, it was probably sweet and if I'd been there longer I might have tried to make friends with it instead, but in the circumstances it was simpler to just get it out of the way. It was another reminder of the film Labyrinth actually, it looked very like the feisty little terrier that guarded the bridge. The table was put out on the balcony the day we arrived and a week later the jasmine had grown around it. 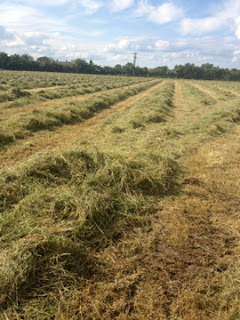 The grass was cut yesterday and baled and removed today. 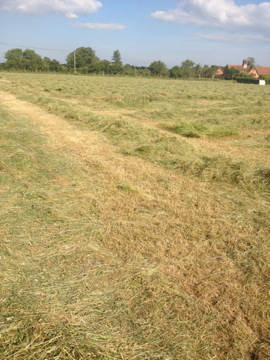 Far too much green still in it to be used as hay, so it'll go to silage or haylage, but it's done and in view of the rain forecast, that's the main thing. There was a very good crop, 41 of the big round bales in a field just under 4 acres in size. The soil is poor, sand on gravel and a small amount of fertiliser was put on in the spring. Afterwards, we went for a walk round the town. It was too hot to stay very long, but it was very picturesque. Apparently, it has been declared a World Heritage site and I suppose that will protect developers from pulling down or altering the buildings, many of which look to be in need of renovation. In the evening, we met friends who had just arrived from England. John has written several books about Corfu, many of them light and entertaining accounts of his walks and journeyings around the islands. He was telling us about an app he's just been working on. "Don't suppose you have an iPhone?" he asked. He asked the right person, darlings, and I spent some time looking at it on his phone and I downloaded it as soon as I arrived home. It's called Walk Corfu, it's free and it's jolly good. It includes maps with marked walking routes, links to advice on walking holidays, pictures of flowers you might spot, photos of scenery, sketches of village scenes and reproductions of Lear paintings. There are also recipes and links to other information. It would be a lovely place to walk, though you'd have to do it in April or October, any other time would be too hot. Tomorrow I'll show you some pictures of Pam and Peter's village and of the views from their house. 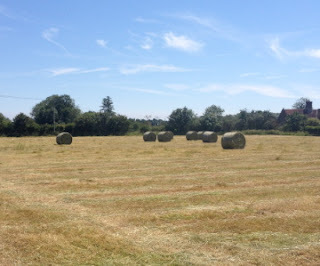 Two singularly dull photos to start with, darlings, to show you the hay crop on our front field. Very good, in fact. Last year it was dreadful, very short and largely nibbled by rabbits. Fewer rabbits this year (don't ask) and we've had plenty of rain. There will be a wedding reception held on this field in 6 weeks so some dry weather now to make the grass go dormant would be appreciated. I'm rather running out of steam on the photo front, so do not be concerned that I'll show you the full 258 or whatever there are. We went to another restaurant for lunch, this time stopping for an ouzo break en route. Here I am, looking fat, with Peter - by the way, do note Peter's lovely ankles. Many a woman would break laws of the land for those ankles (I've had this discussion with Pam who acknowledges their gorgeousness too - mind you, so has she. I feel at such a disadvantage with those two). I'm sure I should know the tree but I don't, please tell me. And the required photo of a lovely little bay. Delicious sardines for lunch at a delightful restaurant. The proprietor, charming as Greek men are hard-wired to be, called me darling when I went to pay. Just one day left, when we went to Corfu town. It's all diminishing into distant memories already. I couldn't live the ex-pat life but I'm starting to understand those who do. I'm afraid, in my terribly boring and responsible way, I still feel I need to validate myself, do something useful and - awful phrase - 'make a difference' but the need to switch off is becoming more necessary to me too. I think that I've worried too much, mostly about the Sage, for the last few months and I certainly haven't slept enough. Although I've made up for it the past couple of nights, when I've gone to bed early and slept for hours and hours. Yesterday, I hardly did anything. I read the papers, made soup, went for a walk, pottered in the greenhouse. Today I've been busy. Music with Year 9, a long meeting with the Head where we each gave the other a long list of jobs to do, I spent the afternoon doing mine. This evening, the first of two new intake evenings at the school. I stood and smiled a lot. Tomorrow, nothing in the diary. Awfully tempting to curl up in an armchair and read all day and that's what I'd have done at one time. Now I'm just so damn responsible that it simply doesn't happen. But I still feel useful and that's the way I like it, reluctant as I am to admit the fact. We went for lunch in a mountain village called Old Perithia. Apparently at one time the mosquitos down by the sea carried malaria, so (I don't suppose the people realised it was mozzies causing their illness in those days) a village was built high enough for the 'bad' air not to affect them. In due course they moved back down again and many of the buildings fell into disuse. Many have been restored and several have opened up as tavernas in recent years. The one that Pam and Peter go to is the original and they have become friendly with the owners. I had a delicious stifado, rabbit stewed with tiny onions in vinegar, tomatoes and spices - there was some cinnamon in there, a hint of cloves, garlic, wine and I have a feeling there were some currants or sultanas though I couldn't distinguish them individually. We left late after a lazy early morning so didn't go down to the seaside town to see Gerald Durrell's house but stopped on the hillside to take a photo. It's the big square one straight ahead, on the waterfront. We stopped again for more photos - P and P are endlessly patient and very kind. We hadn't intended to arrive before 2 pm as there are daily motorbike excursions in the mountains and the riders stop for lunch at our chosen restaurant. As a result of our stops (there had been more in fact, Peter wanted to buy a new phone card, Pam needed some moisturiser as well as the photo-taking) it was just 2.30 when we parked the car and that was ideal as the bikers were just leaving. Pam went inside for a drink while Peter took me for a walk through the village. The paths were steep and the stones quite slippery so I didn't take many pictures. I reflected that three years ago I couldn't have managed the walking and was again grateful for modern surgery. Without being careless or daft (what, me?) I'm going to do all I can before the other hip gives trouble. I tried so many times to get a picture of the butterflies, this is the best of a very poor bunch. And here's a second photo of the cat from yesterday. I liked that picture too, Tim, and it was a friendly little cat so I thanked it by taking its photo. Like many of you, I've been receiving a lot of spam in the past few weeks. It doesn't get published but, if you've subscribed to comments, it's turning up in your inboxes as well as in mine. I've changed the settings so that any comments on posts over two days old go to moderation and (though it doesn't lessen the notification emails to me) I hope that it means you don't receive them. If it's just too annoying, I'll have to turn on word verification again but that's so hard to read that I'd rather put up with the spam for now. Today it's the Sage's birthday, so the family came to lunch, plus Phil's parents who are staying with him and Weeza for the weekend. Phil himself had visited friends overnight, so didn't turn up until 2 o'clock, having cycled 17 miles from Diss station (later he cycled 25 miles home again) and I reheated his meal for him. I had to work fast this morning, not having got up early though having woken before 7 as I was too tired, and spent a swift 2 1/2 hours cleaning downstairs (I didn't expect the Sage to have done any housework), preparing the meal, laying the table and so on. There's always a job that can be left if push comes to shove, this time it was washing the kitchen floor (though it did need doing, I suspect the Sage spent the week spilling drinks and not mopping them up as it was quite sticky) and I did do it and used the water to wash the porch floor too - and I still made it to church on time. We had a lovely time, I do enjoy feeding lots of people and love the preparation. Some more photos darling, if you will indulge me. We drove down to the south of the island and up to a little village for a drink. Lemonade, since you ask. The lady in the café, who knows Pam and Peter, brought cake too as well as a 2 litre bottle of her red wine, which Peter and I drank over the next few days and was very good. I went for a quick walk around the village afterwards, which was delightful, and took pictures of the swallows' nests and the houses as well as the views. Just before reaching the village, Peter had stopped for a 'photo opportunity' and you could see the sea both west and eastwards.